The University of Toledo's Initiative for Religious Understanding hosted a lecture series titled "Islamophobia: Ground Zero, Burning Books and Americas Future." The lecture was held at the University of Toledo Law Center. 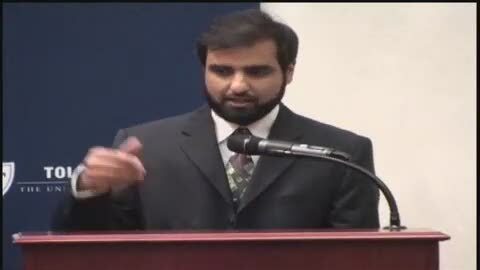 "Universities across the country are doing lectures similar to this, as it is becoming a serious and dangerous issue in America," said Dr. Ovamir Anjum, UT Imam Khattab Endowed Chair of Islamic Studies. Anjum spoke about the history and the future of phobias about Islam in America. "Islamophobia is particularly bad now, much worse than even right after 9/11. This is perhaps mostly for political reasons," he said. "Our purpose is to teach the Toledo community why such fears harm us all, and what we can do instead." His lecture was followed by Benjamin Davis, UT associate professor of law, who talked about Islamophobia and civil rights. David Yonke, the religion editor for The Blade newspaper, discussed Islamophobia in the Toledo area. "As religion editor for the last 10 years, I’ve spoken with many people from all faiths, so I’m hoping to be able to share some of the things I’ve experienced," Yonke said. "I see a lot of signs of Islamophobia in the Toledo area, and I think that information and education is key to people understanding one another and getting along better." The final panelist, Ed Heilman, pastor of Park Congregational United Church of Christ, addressed the Christian perspective of this issue.